Naked by David Sedaris, Little Brown and Company, 1997, 291 pp. I realize I’m way behind on the David Sedaris bandwagon. I’ve been listening to him on This American Life for years. I’ve read Holidays on Ice, but that was as far as it went. Finally I took the plunge into Naked. To be honest, it took me awhile to sink into his style in print. Sedaris’ style is to tell a story with huge exaggeration and over-the-top imagery, yet with a dry, matter-of-factness that makes you wonder if it isn’t the truth. As a reader, I felt constantly unsettled. How much of this is accurate, and how much is he pulling my leg? Is this supposed to be funny, or just dark and pathetic? Did this really happen at all? Does it matter? Naked is written as a series of shorter pieces, loosely connected as segments of a memoir, but not chronological or cohesive except in their exaggerated style. After I had read a few of them, I began to appreciate him more and more. There is a darkness to all his writing, in spite of its humor. His brokenness, loneliness and aimlessness are front and center in every story he recounts. If there is a theme in the entire collection, it is the gap between his high opinion of himself and the reality of his life and accomplishments. That gap begins in the opening paragraphs of Naked, which are a fantasy of wealth and status in sharp contrast to his awkward and humble reality. All through his journeys as a migrant worker, a hitchhiker, and a drifter, the gap between his internal fantasy and brutal reality slowly begins to close. Finally, in the last section (from which the book takes its title), Sedaris recounts his trip to a nudist camp, literally and figuratively stripping down to nothing, becoming naked with himself as he truly is, and even finding a sense of acceptance with himself at last. While Naked is humorous at times, it is never light. The themes are dark and sometimes disturbing, but there is hope and even healing at work. 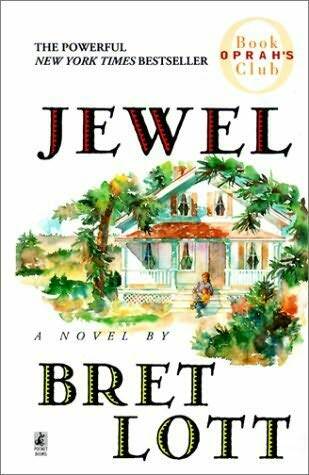 Jewel by Bret Lott, Washington Square Press (Simon & Schuster), 1991, 358 pp. This is a novel about a woman of great strength, love and willpower. Exactly my kind of story. Jewel is born in the backwoods of Mississippi in 1904, orphaned at age 11, sent to live with a grandmother who hates her and then a harsh reform school. She makes her way in the world, finding a husband who loves her and giving birth to five children. Her sixth child is born in 1942 with great difficulty, and does not develop like the other children. This daughter, Brenda Kay, has Down’s Syndrome. The custom of the day was to place children with developmental disabilities into an institution, and the doctors declare that Brenda Kay’s life expectancy is only two years. However, Jewel and her husband Leston will not part with their daughter, and vow to do everything in their power to make Brenda Kay’s life as full and rich as possible. This commitment costs them and costs their family almost everything they have, but Jewel, Leston and the other five children make the sacrifices almost without complaint. Brenda Kay lives into adulthood, and learns to walk, talk and interact with the world. I thanked God for this all, even though I knew it was me would be following her all the way through her time on this earth, unless i took to heart the task before me, the one set up by the same God who’d given her to me: find a way to fix this, not simply watch from behind as she walked straight across the face of her days. I loved Jewel’s resolve in this book. I loved that her husband, Leston, was neither an evil abuser nor a simple romantic figure–he was a complicated man with deep feelings of his own, and the book showed their negotiations throughout their marriage. I loved that Brenda Kay was a subject and not just an object, and that Lott detailed both the joy and the burden of lifelong care for a special needs child. The story was always moving, the characters always growing and evolving, but never perfect. This novel was simply a great read, rewarding and enriching. Bret Lott created a beautiful world for this family, and I was transported into it as I followed along their life’s journey. Read and delight.